Like any business, physical or operational changes to a pharmacy may be needed from time to time in order to meet the needs of the patients it serves. These changes must be reported to the College in accordance with the Pharmacy Operations and Drug Scheduling Act (PODSA), the Pharmacy Operations General Regulation, and the College’s bylaws. It is important to understand who is responsible for reporting these changes, as well as the additional requirements that must be submitted in order to complete the application. Please note that some of the changes listed below will result in a new pharmacy licence being issued, or an amendment to your current pharmacy licence. Please note that the following changes do not require the completion of a Proof of Eligibility. Under section 4.1(3) of the Pharmacy Operations and Drug Scheduling Act, the direct owner must provide the registrar with a 30-day written notice of any changes to the name of the pharmacy. Notice is provided through an application form completed by an authorized representative of the direct owner. Additional requirements reflecting a change of operating name must be submitted prior to the effective date of change. More information can be found on the Change of Operating Name webpage on the College’s website and details can be found in the Pharmacy Licensure Guide. Note that this type of change will result in an amendment to the current pharmacy licence to include the new pharmacy name. Making changes to a physical fixture or structure in the pharmacy (e.g. removing/adding a wall). Please note that for licensure purposes, changes that do not impact the pharmacy diagram are not considered changes in layout. Examples include: changing the colour scheme of the pharmacy (e.g. wall/counter top), changing the “medication information” sign without changing the location, or changing the location of your microwave (not a physical requirement for licensure purposes). Under section 4.1(3) of the Pharmacy Operations and Drug Scheduling Act, the direct owner must provide the registrar 30 days' written notice of any changes to the layout of the pharmacy. Notice is provided through an application form completed by an authorized representative of the direct owner prior to the start of the “renovation”. The application process for a change of layout mirrors that of applying for a new pharmacy licence with a simplified pre-opening process focused on the physical areas of the pharmacy and the dispensary. More information can be found on the Change in Layout webpage on the College’s website with additional details found in the Pharmacy Licensure Guide. The application process for moving a pharmacy to a different location essentially mirrors that of applying for a new pharmacy licence, without requiring the submission of Proof of Eligibility from the direct/indirect owner(s) or the pharmacy manager. 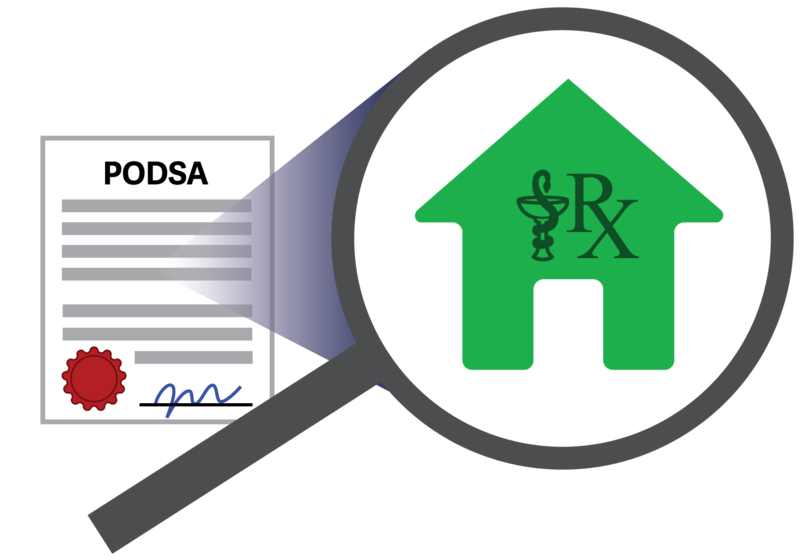 Prior to closing the old location, the manager is responsible for ensuring the requirements for pharmacy closure and relocation under section 18(2)(t) of the PODSA Bylaws are followed. A new pharmacy licence will be issued to the pharmacy once it meets all the physical requirements in its new location. The pharmacy in the old location must be closed when the pharmacy licence is issued for the new location, as the pharmacy licence for the old location will be cancelled on the same day. More information can be found on the Change in Location webpage on the College’s website and details can be found in the Pharmacy Licensure Guide. Pursuant to section 3(c) and 18(2)(cc) of PODSA, the pharmacy manager is responsible for the actual management and operation of the pharmacy and is thus responsible for reporting changes of operational information previously provided to the College. Under the Profile tab, you can update the pharmacy’s email address, website, and the name or version of the dispensing software used at the pharmacy. Under the Staff tab, you can update the staff roster. See the Reporting Changes of Pharmacy Managers and Personnel ReadLinks article to learn about your responsibilities. Under the Services tab, you may update the pharmacy’s hours of operation, lock-and-leave hours, and types of services provided by or at your pharmacy. Need help updating any of the above information? See the Updating Pharmacy Information eServices Tutorial section for the Pharmacy Portal in the Pharmacy Licensure Guide (starting on page 105). Please note that if you need to update the pharmacy’s phone number or fax number, you will need to email the new information to the Licensure Department at licensure@bcpharmacists.org. If multiple changes occur at the same time, the authorized representative of the direct owner will have to submit multiple change applications at the same time. This article, as well as the previous ReadLinks articles on Reporting Change of Ownership and Reporting Changes of Pharmacy Managers and Personnel discuss the processes involved in reporting these types of individual types of changes to a pharmacy. Updating Pharmacy Information – Pharmacy Staff Roster in the Pharmacy Licensure Guide.